Our Saviour having been conceived by the Holy Ghost, and His Blessed Mother remaining always a spotless virgin, it is evident that She was not subject to the law of purification, but devotion and zeal to honor God by every observance prescribed by His law, prompted Mary to perform this act of religion. Besides the law which obliged the mother to purify herself, there was another which required that the first-born son be offered to God, and that after his presentation the child be ransomed with a certain sum of money, and specific sacrifices offered on the occasion. Mary complied exactly with all these ordinances. She obeyed not only in the essential points of the law, but had strict regard to all the circumstances. On the day of Her purification She walked several miles to Jerusalem, with the world's Redeemer in Her arms. She waited for the priest at the gate of the Temple, made Her offerings of thanksgiving and expiation, and with the most profound humility, adoration and thanksgiving, presented Her divine Son, by the hands of the priest, to His Eternal Father. She then redeemed Him with five shekels, as the law appoints, and received Him back again as a sacred charge committed to Her special care, until the Father would again demand Him for the full accomplishment of man's redemption. 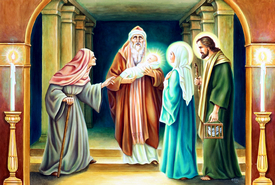 The ceremony of this day closed in a third mystery  the meeting in the Temple of the holy prophets Simeon and Anne with the Divine Infant and His parents. Saint Simeon, on that occasion, received into his arms the object of all his desires and sighs, and praised God for the happiness of beholding the much-longed-for Messiah. He foretold to Mary Her martyrdom of sorrow, and that Jesus would bring redemption to those who would accept it on the terms it was offered, but a heavy judgment on all who would obstinately reject it. Mary, hearing this terrible prediction, courageously and sweetly committed all to God's holy Will. Simeon, having beheld Our Saviour, exclaimed: Now Thou canst dismiss Thy servant, O Lord, in peace, according to Thy word, because mine eyes have seen Thy salvation. The aged prophetess Anne, who had served God with great fervor during her long widowhood, also had the happiness of recognizing and adoring the Redeemer of the world. This feast is called Candlemas, because the Church blesses the candles to be borne in the procession of the day. Reflection. Let us strive to imitate the humility of the ever-blessed Mother of God, remembering that humility is the path which leads to lasting peace and brings us closer to God, who gives His grace to the humble. Little Pictorial Lives of the Saints, a compilation based on Butler's Lives of the Saints and other sources by John Gilmary Shea (Benziger Brothers: New York, 1894); The Holy Bible: Old and New Testaments. Whoever will force you to go for one mile, go with him two.